JYP Entertainment's head producer Park Jin-young has denied reports that claim he is a follower of a religious group called the Evangelical Baptist Church of Korea, more commonly known as the Salvation Sect. On Wednesday, a local media outlet published a report that said Park was deeply involved with the group and that he had participated in the group's meeting on March 21 in Yeoksam-dong, Seoul, and led an event for a week. The sect was once led by the billionaire religious leader Yoo Byung-eun, an alleged owner of the Sewol ferry that sank in April 2014, killing more than 300 people. In July 2014, Yoo's body was discovered by police after an extensive manhunt. The sect reportedly has some 100 churches in Korea and about 200,000 members worldwide. 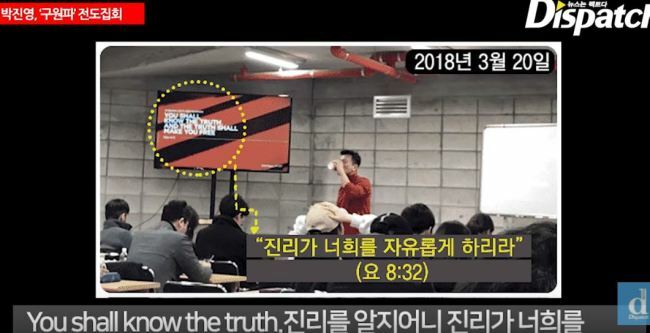 Photos, videos and recordings revealed by the media outlet showed Park avidly talking about his belief in the religion to other participants of the group's event. According to the report, actor Bae Yong-joon, who is known to be Park's close friend, also attended the event. Shortly after the news broke, Park took to his personal Instagram account to refute the report. He claimed the meeting was merely for bible studies. "I rented the place with my own money and led bible studies. Is this a Salvation Sect meeting?" he wrote. "About 100 people gathered to listen to my lecture, and some of them were believers of the sect. ... I've already made sure that I have nothing to do with the group both personally and at the company level. I started this bible studies with my friend four years ago and have been meeting twice a week, and now it has about 30 members." "I will share a document of my testimony, so that you can scan it carefully. If it contains anything against the law or morality, your (reporters') coverage is legitimate. But if it doesn't, you will be liable for any damage caused to us." JYP Entertainment said that it is looking into the matter. In April 2014, after the Sewol ferry disaster, Park was embroiled in a controversy regarding his ties with the sect, as his wife was reported to be a niece of Yoo. While admitting his wife's connection to Yoo, Park had refuted the rumours, saying that he was not related to the group at all and that he did not have a religion himself. Known as a "millionaire with no face" because of his rare public appearances, Yoo was the ex-chairman of Chonghaejin Marine, the operator of the Sewol ferry. Following the report, JYP shares fell about 10.26 per cent on the stock market as of Wednesday at 11:45 a.m., with the company's share price plummeting to 19,500 won ($18).